The original Delhi Belly was deemed a s** comedy for its many risqué jokes and double entendres. 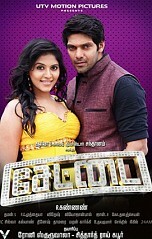 Settai has retained the film’s original theme, but according to the makers, the screenplay was modified to suit the Tamil audience. Unfortunately, in the process, all the fun and laughter has been taken out of the film and what we are left with is a poor reproduction of a great original. The director has ruined a perfectly good script and has given an absolutely boring version of the exciting and racy Delhi Belly. From beginning to end, the film follows the same pace and all the scenes are so boring and slow, you could actually sleep through the entire movie. Settai is, sadly, a great disappointment. The flavor and the main essence of the original was its heavy adult content which worked for the film big time. But it is evident that Kannan’s intentions are to present the film with Tamil sensibilities in a much diluted form which works against Settai. Toilet humor is one segment that has not been tried in Tamil cinema and hence the director has treaded the path with a lot of caution, resulting in it becoming a spoke in the wheel. The humor component is there in Settai but not a rollicking one.The first half moves a bit slowly. It is in the second half that the film picks up some kind of momentum, majorly due to Santhanam. To sum it up, for all those who have watched the original, Settai is a fizz free product and for the rest, the film may work in parts. This film is a perfect, stand-alone mood enhancer. UTV’s remake of Delhi Belly lives up to all the hype about a roller coaster ride. The film works big time because of the terrific chemistry between Arya and Santhanam, something we saw in Bosss. At just two hours and five minutes, the film is perfectly packaged, with hardly a dull moment. Anjali has gone for a role that could help shed her stereotyped image of a lower middle class girl. Wish she had paid attention to her clothes as well. Hansika is adequate as the glam quotient. But it is the men who steal the show and provide the laughs. The toilet humour is kept within limits so you can take your uncles, grandmoms and the nephew you are baby sitting. In short, paisa vasool.